When it comes to providing exceptional care, skilled treatment, advanced technology, and overall patient satisfaction, Dr. Masha Kogan and the Dental Center of Westport team are among the best in Fairfield County. A group of peer dental practitioners were asked the question, “If you had to refer someone to a dentist (besides yourself), who would you refer them to?” Dr. Kogan’s peers included her on this list in 2014 and on the most recent 2015 list as well. The list is compiled annually by Moffly Media for its July/August issues of Fairfield Living and the related community magazines. 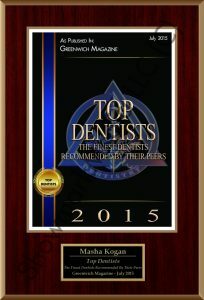 Dr. Kogan and her dental team are proud to be included in this prestigious list of dental practitioners, and continue offering superior service and skilled care to every patient. To anyone familiar with Dr. Kogan’s commitment to education, training, and continually improving her dental practice, it comes as no surprise that she would be included in a top dentists list. She has practiced dentistry for more than two decades, and worked the majority of her career serving patients at the Dental Center of Westport. Dr. Kogan earned her Doctor of Dental Surgery degree from the New York University College of Dentistry, but since then her education has not stopped. She considers herself a lifelong learner, and has taken a special interest in cosmetic dentistry studying at the Rosenthal Institute and SPEAR Education advanced cosmetic dentistry training. Additionally, Dr. Kogan dedicates numerous hours annually to continuing education courses where she has had the opportunity to learn from some of the most influential and respected dental practitioners in the country. In addition to being highly respected by her peers, Dr. Kogan regularly receives rave reviews from patients. One patient recently said, “I was very impressed with the level of care. I would recommend this practice to anyone.” According to top dentists, this patient is not alone! One of the many reasons Dr. Kogan’s peers voted her among top dentists in Fairfield County is that she always stays on the cutting edge of dental innovation and technology. Dr. Kogan is always striving to offer new services and treatments that improve patient comfort and satisfaction. For example, one of the services we are offering is a “Trial Smile”, an in-office new smile preview. Patients interested in making a change to their smile with porcelain veneers can visit us for initial photos of their smile as well as impressions of their teeth. In about ten days a patient can return to have a mock-up of their proposed new smile over-layed on their teeth for a preview. We’ll take photos, which patients can share with family and friends before making a final decision. This is a great service to help a patient decide if a “smile makeover” with porcelain veneers is for them. Interested in finding out more about “Trial Smile” or would like to schedule an appointment? Call the friendly Dental Center of Westport team today.